State Rep. Nicole Macri has responded to survey results that show some Montlake residents — and their supporters across Seattle — would do pretty much anything to save the Montlake Market from being torn down and eliminated during construction of new SR-520 improvements through the area. “Further, WSDOT is required to work with the City to allow food vendors in the area and develop a communication outreach plan to the community to solicit community input as to the food services provided,” Macri’s announcement reads. The proviso is part of a $10 billion transportation budget proposed by House Democrats that “makes investments in each part of the state to get people where they need to be and get goods shipped around the world. It includes major funding to remove fish-barriers on state roads as part of the broader solution to helping our struggling orca population,” Macri said. While it seems a tempest in a teapot, residents have told WSDOT they are willing for the state to spend millions in possible construction and delay costs to save the market which has been planned to be removed to make way for the $455.3 million in projects to create an improved Montlake Boulevard interchange, a landscaped lid over SR 520, a bicycle and pedestrian “land bridge” east of the lid, and a three-lane West Approach Bridge South over Union Bay for eastbound traffic. CHS reported on the various options for keeping the market and WSDOT’s efforts to gather neighborhood feedback here. You can read WSDOT’s report on the community feedback here (PDF). The Montlake Blvd Market, or Hop-In, lists an opening year of 1936. The property’s owner has been Lynne Parrott, a Clyde Hill resident and Bellevue developer Kemper Freeman, Jr.’s niece, according to King County records. The property has a taxable value of around $1.4 million. Construction is slated to start later this year and the work could wrap up in 2023. The Montlake Community Club is building houses for our homeless neighbors as a step toward permanent housing. We are looking for volunteers to build these houses in Redmond the weekends of June 8th and June 15th. You can sign up for more than one shift. Also, any donation will help. Thanks in advance for your contribution to this project. In order to prepare for design and construction of the SR 520 Montlake Project, our contractor, Graham Contracting, will conduct daytime and nighttime exploratory work in the Montlake neighborhood. This work will begin the week of April 15 and last three to four weeks. Crews will use drilling equipment to collect soil samples and additional equipment to cut holes in the roadway, remove soils, and locate underground utilities. This early work, often referred to as utility locating and subsurface geotechnical investigation, is being done to support the design of the project. The map below shows the location of this work. How can you provide feedback on early work? Graham has developed a Community Construction Management Plan (CCMP) specific to this preconstruction work. Please review the Early Work CCMP and take this survey to let us know your thoughts on our procedures to avoid, minimize, and reduce the effects of this work on neighbors. The Early Work CCMP identifies best measures and practices to reduce construction effects on the nearby neighbors and travelers on the SR 520 corridor. The Early Work CCMP allows members of the public an ongoing opportunity to provide input on these measures. The Early Work survey will remain open through Tuesday, April 16. This Early Work document will be a part of a more comprehensive CCMP for major construction. You will have another opportunity later this spring to comment on the comprehensive Montlake Project CCMP currently under development. Call the 24-hour construction hotline (206-775-8885) with pressing Montlake Project questions or concerns. Call the SR 520 Program information line (206-770-3554, M-F 8 a.m. – 5 p.m.) with general SR 520 inquiries. Email SR 520 staff with your questions about the project or construction activities. Visit the SR 520 Construction Corner for the most up-to-date information on closures and construction impacts. Visit the SR 520 Program website to find general information about the project. Follow us on Twitter @wsdot_520 to get key news and updates about the SR 520 program. As we prepare for the start of major SR 520 Montlake Project construction later this spring, our design-builder, Graham Contracting Ltd., will conduct exploratory work in the Montlake neighborhood, beginning the week of April 15. This is daytime work and requires a short-term closure of the alley. This work will not take place on Wednesdays to avoid conflict with trash and recycling collection. This daytime work requires the closure of East North Street during work hours, for two to three days. Local access will be available from 24th Avenue East. 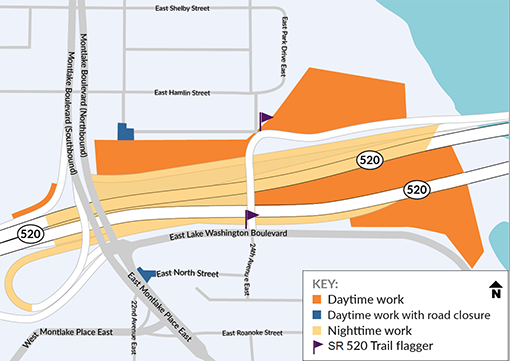 This daytime work will require intermittent closures (5 to 10 minutes) of the SR 520 Trail. This will require nighttime single-lane closures on the westbound off-ramp to Montlake Boulevard, the eastbound on-ramp from Montlake Boulevard, and on westbound SR 520 east of Montlake Boulevard. This work includes pavement removal and repair as well as removing dirt with pressurized water, vacuums, and backhoes. Much of this work will occur between 7 a.m. and 7 p.m., with some work occurring at night between 7 p.m. and 7 a.m. We are applying for a temporary noise variance from the city of Seattle to conduct the nighttime work. Nearby neighbors should expect typical construction impacts, such as increased noise, vibration, dust, and truck activity. We will comply with construction best management practices as well as all city of Seattle regulations to reduce the effects of this work. We have a number of resources to help you stay up to date about planned construction activities and find information about how to get around during construction. You can find these resources, such as our new 24-hour construction hotline (206-775-8885) and our new SR 520 Construction Corner webpages, at the bottom of this email. We’ll provide more information about dates and times of these closures as we get closer to the work. A new shipment of Montlake gear is here! All styles and sizes now available. Pop-Up Shops Tuesdays April 9, May 14, and June 11 at 6:30 in the Boyer Clinic basement conference room. Go to Montlake Gear for pictures and prices. Thanks for supporting your neighborhood organization. The annual Arboretum Spring Plant Sale<https://www.arboretumfoundation.org/events/spring-plant-sale/> (formerly “Early Bloomers”) will take place at the Graham Visitors Center (2300 Arboretum Drive East, Seattle) on Saturday, April 6, from 10 a.m. to 2 p.m. Enjoy a stroll in Seattle’s premier public garden while it’s in peak bloom, and then buy beautiful, quality plants for your own garden and home. Parking and admission are free. * A nice selection of classic garden perennials, spring bloomers, native plants, and versatile shrubs at our Plant Donations Nursery<http://www.arboretumfoundation.org/shop/plant-donations-nursery/>. * A unique selection of flowering shrubs, small trees, compact conifers, and unusual perennials at our Pat Calvert Greenhouse<http://www.arboretumfoundation.org/shop/pat-calvert-greenhouse/>. * Houseplant Pop-Up: Fremont-based Urban Earth Nursery<https://www.urbanearthnursery.com/> will also be on-site selling a wide selection of indoor plants and succulents. All sales support the maintenance, children’s education, and volunteer programs at Washington Park Arboretum! For information, go to www.arboretumfoundation.org or call 206-325-4510. Interested in the MCC board? Join us at Cafe Lago this Wednesday, March 27th at 5:00 p.m.
Who’s on the MCC board? What do they do? How can I get involved? Please join the MCC board for beer, wine, and hors d’oeuvres at Cafe Lago this Wednesday, March 27th at 5:00 pm. Board members will be on hand to answer any questions you have and fill you in on what the Montlake Community Club board is all about. What is the Montlake Community Club (MCC)? The MCC is the collection of homes and businesses that have a street address in the Montlake neighborhood. All residents, property owners and business operators, 18 years of age or older are eligible to become members of the MCC. Who is the MCC Board? The MCC board consists of up to 13 volunteer MCC members including a President, Vice‐President, Treasurer, and Secretary. The officers serve with up to nine trustees. The board holds monthly meetings throughout most of the year on the first Tuesday evening of the Month at the Boyer Children’s Clinic. What is the objective of the MCC and what are some of the committees? The object of the MCC is to maintain and improve the Montlake neighborhood. Committees include transportation, Turkey Trot, fundraising, recruitment, yard sale, and communications. You can volunteer for a committee without serving as a trustee. What are some of the MCC board’s key Initiatives and Events? The MCC board is a completely volunteer organization. We are always in search of new MCC members who want to help in any capacity, whether by serving on the board or volunteering for any of our key committees, initiatives or events. New board trustees are asked to select one or two of the projects they would like to work on. Typical involvement is a one-hour board meeting monthly and a few hours annually on a project. Please send by April 30 for consideration for the upcoming Trustee election. Hello Turkey Trotters! 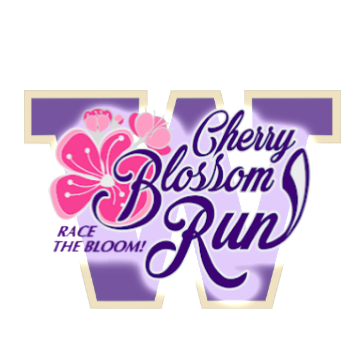 Join over 1,000 participants for PEAK bloom of UW cherry blossoms! We all know the Washington Park Arboretum! Now run through the second Seattle gem managed by the UW Botanic Gardens: the UW Center for Urban Horticulture! Finish at Red Square. Then head into an amazing oasis of iconic cherry blossoms in The Quad. The Quad at UW possesses one of the nation’s most stunning displays of cherry blossoms. Every year thousands of people come to the campus to view them. 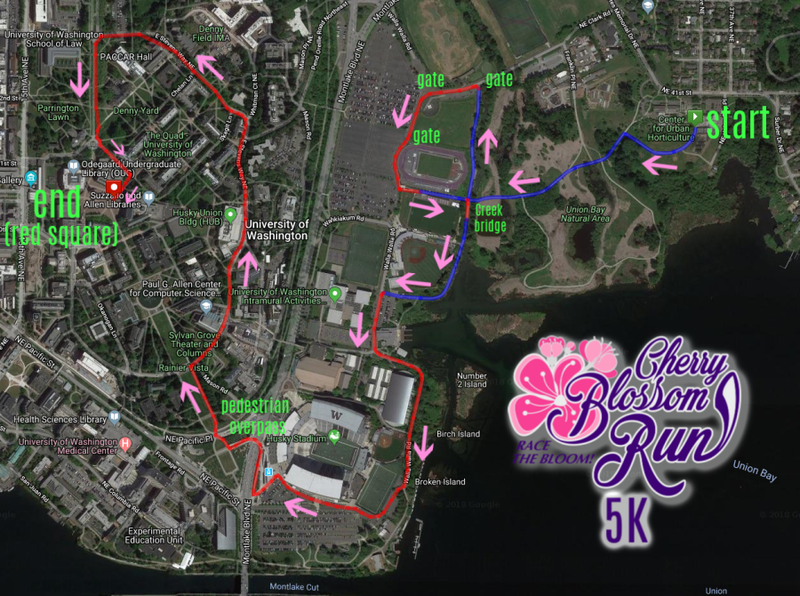 Don’t miss out on this annual celebration and one of Seattle’s most beautiful 5K runs! 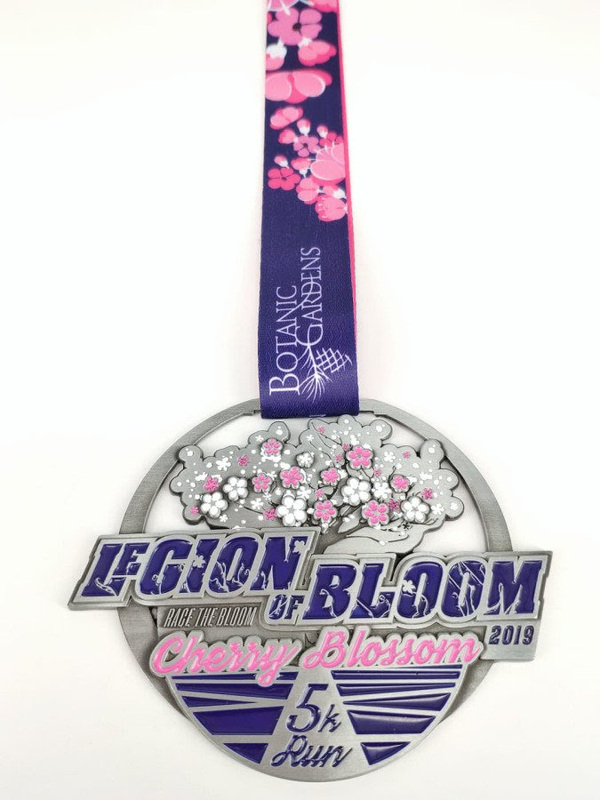 Commemorative medals are sold separately and Legion of Bloom medals will be awarded to the top finishers! Participant tech shirts are included with every registration. All proceeds benefit the UW Botanic Gardens. 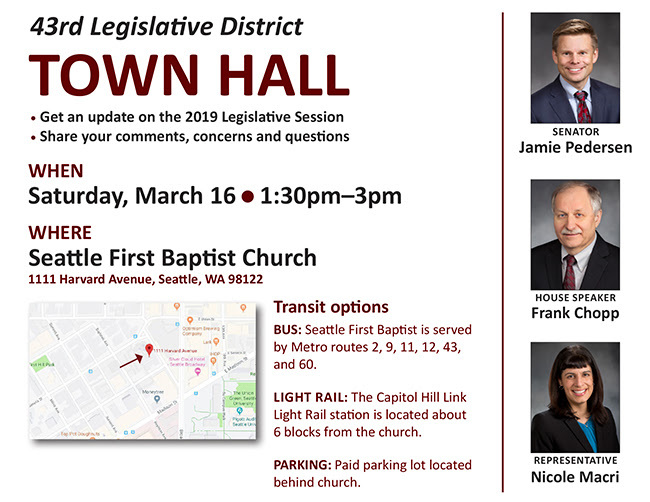 Please join Speaker Chopp, Sen. Pedersen, and me this Saturday for a 43rd Legislative District Town Hall meeting from 1:30-3pm at Seattle First Baptist (1111 Harvard Ave).